Do you want to get the most from your co-working space? The Shared Desk membership is NuvoDesk’s most popular package, offering wide-open flexibility and freedom that lets you work on your own terms. Get everything you want from your workspace and more! Are you driven by working with others? You’ll get amazing opportunities to connect with other hard-working professionals like yourself. Network with others and be even more motivated. Shared Desk members get extra hour access to NuvoDesk facilities. 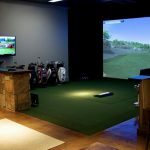 That means you’ve got extra hours in the morning and at night to work, plus you’ll get even more access to our video production area, golf simulation room, and common areas. Shared Desk members enjoy the most out of flex workspaces. Choose how you work and get more done on your own terms. The ability to scale your NuvoDesk workspace to fit your needs on the fly helps you stay focused for maximum productivity. All the perks you see here are within your reach. Getting started as a Shared Desk member with NuvoDesk is simple. You can book your membership right now online, or you can schedule an on-site preview. Come see everything we have to offer by contacting us for a tour today.